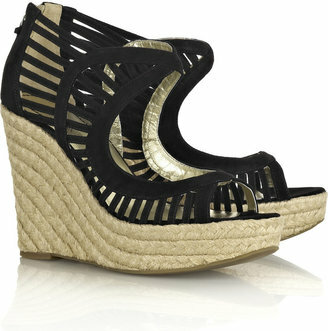 These Belle by Sigerson Morrison Strappy Lattice espadrille wedges sell for $240 at Net-a-Porter.com. They look a lot like the Jimmy Choo 'Keenan' Caged Sandal, turned into an espadrille wedge. Save some cash with the Exsell wedge sandal from Steve Madden, available in black snake, natural snake or red snake for $169.95 at stevemadden.com. At that price, you might be better off waiting for the Sigerson Morrison sandals to just go on sale, but that's just me! You can also sign up for Shop It To Me's personalized sale alerts so you'll know when the 'Exsell'—or any other sandal you love—goes on sale.